Region of Usti nad Labem, in a bee line 30 km south-west from the city Louny. The oldest extant allusions to Krásný Dvůr date back to the 14th century. A crop of feudalists took successive turns int this dominion (the Fremuts, the Kolovrats, Šimon Karel Oudrický, Václav Michna of Vacínov and others. But it was the House of Černíns, which had bought the dominion in Krásný Dvůr (by Heřman Černín of Chudenice) in the middle of the 17th century, that entered most into the history of Krásný Dvůr. One of them, František Josef Černín decided to start an extensive reconstruction of a Renaissance villa (built in the place of an original fortified settlement by Jan Maštovský of Kolovraty in the end of the 16th century. The project of the reconstruction was made by well-known Czech architect František Maxmilián Kaňka. Works started in January 1720 and finished in 1724. It appears from archival materials that the original project of the reconstruction was worked over by request of F. J. Černín round the middle of the works. 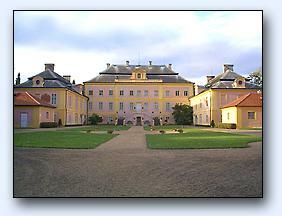 The object of Krásný Dvůr Chateau carries a distinct influence of the French architecture. The building is incroporated into the surrounding landscape in a very natural and delicate way and has become its dominance. Today 18 rooms and lobby galleries are open to the public in the Chateau. Excellent, very valuable paintings of Czech and European authors (as far as the best known authors are concerned, Petr Brandl, Ludvík Kohl, Josef Bergler, Karel Škréta, Filip Kristian Benthum, Kristian Brand, Alžběta Vigée-Lebrun and a number of others are represented here), are installed here, and then there is a number of graphic arts, porcelain, china, glass, earthenware, clocks, original Adam fireplaces, furniture and other samples of historical craftsmen's skills. Some thematic collections are also remarkable (e. g. wide Baroque pictorial anthology of dog-portrayals by an artist Petr Václav. A natural scenic park in Krásný Dvůr, whose area amounts to 100 hectares, was founded in 1783-1793 by Jan Rudolf Černín of Chudenice. This reality was influenced partly by his botanic inclinations and then also by his journey round Western Europe, which he undertook in 1779. Those days a new park trend started expanding into Europe from England. Natural scenery was to be brought into the very neighbourhood of buildings according to this trend. The principle of the natural scenic park is based directly on the condition of natural landscape, not artificially man-made one. 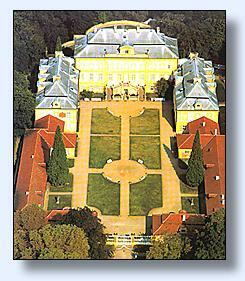 The Chateau Park on Krásný Dvůr is a substantial evidence of this reality. In accordance with taste of those days it was brightened with a number of Romantic buildings enriching vacant fields or closing various vistas of park scenes. With guide, 45 min., maximum 35 people. Saling the souvenir, reservation of tours. Pouze na čestný dvůr a do parku.